Should you wish to book an apartment with sea view close to the sea, this apartment is what you are looking for. 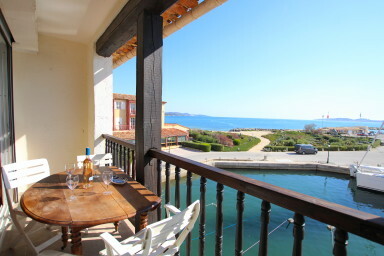 This 2-room apartment with a large mezzanine is located at the entrance of the harbour and has a balcony with a wonderful view on Saint Tropez and the sea. As a typical apartment, it has nices spaces and can accomodate up to 5 people. It is composed of a living-room with a mezzanine done as a bedroom with 3 single beds for children aged of 6 years'old minimum, an open kitchen, a bedroom with a double bed and a shower-room. On the sea side, a balcony wit a superb view.